Kahu Charles Kauluwehi Maxwell directed UH Institute for Astronomy Assistant Director Mike Maberry as he splashed a mixture of water from Hana and sea salt from Niihau on the site of a new Maui headquarters for the University of Hawaii Institute for Astronomy during a groundbreaking ceremony Friday afternoon at the Kulamalu site. 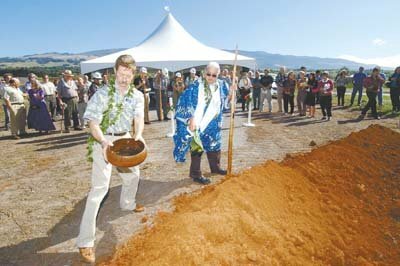 KULA – The University of Hawaii's Institute for Astronomy broke ground Friday on a new research center and laboratory in Kula that will have a key role in attracting more cutting-edge astronomy projects and technology to Maui, IfA leaders said. The facility will support observatories on Haleakala, with more research space at the lower elevation to accommodate the growing demands of researchers. The IfA officials cited the laboratory facility as an important reason why Maui was selected last week as the preferred site for the planned Advanced Technology Solar Telescope – a $161 million project that would make Haleakala an international center for solar research. If construction begins as planned in late February and takes the expected nine months, the Kula research facility could be complete by the end of 2005, said Michael Maberry, assistant director of the IfA. It will be built on a 2-acre site in Kulamalu, which offers not only basic infrastructure but also capacity for a high broadband-width system needed to rapidly transmit data from summit observatories to the research center and the Maui High Performance Computing Center in Kihei. In addition to labs and office rooms, the 15,000-square-foot research center will feature a "clean room" and a 27-inch "controlled mirror" that will reflect sunlight or starlight into the laboratory for research projects. Just as important is the facility's physical location, relatively close to summit observatories but also not far from the high-performance computer and the Maui Research and Technology Park in Kihei. "It's almost an ideal location," said IfA Director Rolf-Peter Kudritzki. The $8.6 million Advanced Technology Research Center will replace an 80-year-old farmhouse UH astronomers have been using as their Maui headquarters for 40 years. "We do as much of our work there as we can," Kudritzki said. "But it's an old building and it's falling apart." He said the primary function of the new facility will be the development of new technologies for use at Haleakala's observatories. Sophisticated sensors, timers, control systems and electronics are all spinoff technologies developed to support astronomical research, he noted. Inventing and testing those technologies in Kula will be far more efficient than developing them at the UH-Manoa campus and transporting them to Maui, as was done in the past, he said. Kudritzki also hoped the facility would be a better environment for scientists to collaborate and share ideas. "We hope people will meet in our building and work together," he said. About 20 people work out of the IfA's current Maui building, and that number could expand significantly with the new facility, he said. In addition to the existing array of observatories on the summit, the Kulamalu research center will be essential for support operations for the ATST, the largest and most advanced solar telescope in the world when it is built. Maui was chosen after a search committee reviewed 70 sites around the world, he said. Kudritzki said he felt the research center would continue to make Maui an attractive location for astronomical researchers and their "big projects." Delivering the blessing on the site Friday was Kahu Charles Kauluwehi Maxwell Sr., who has opposed or challenged astronomical developments on Haleakala in the past because he felt they did not respect the cultural significance of the mountain to Native Hawaiians. He said Friday he was glad IfA officials had included him in crafting cultural guidelines for telescope construction and operations on Haleakala. "In order for people to respect Hawaiian culture, you've got to make them," he said before he gave the blessing. James Gaines, interim vice president for research at the University of Hawaii, said the support of the Native Hawaiian community would be "essential" to the continued use of Haleakala for astronomy, and that cultural concerns must be respected. In addition to the new solar telescope, which is expected to be operational in 2011, the new research center will support a plethora of Haleakala observatories and programs. For the UH, they include the existing Mees Solar Observatory and the Lure Observatory which houses the University of Tokyo's MAGNUM telescope and the planned Pan-STARRS prototype telescope. A Zodiacal Light Observatory is attached to Mees with the under-construction Solar-C telescope. The IfA is also a partner on the Faulkes Telescope, which will allow students in Hawaii and in England to conduct observations from their classrooms through an Internet link. Haleakala also is home for the Air Force Research Laboratory's Maui Space Surveillance Complex, which houses the Advanced Electro-Optical System, a variety of telescopes, and the Ground-Based Electro Optical Deep Space Surveillance System. The Air Force observatories, whose mission includes tracking satellites, asteroids and other objects in space, is a key reason Maui was selected for the Maui High Performance Computing Center based at the Maui Research & Technology Park.